Innovative Horizons offers organizations around the globe the opportunity to maximize their organizational effectiveness by enhancing the leadership, communications, and team building skills and proficiencies of their employees. Since the dawning of man as a roamer of the plains, humans have been in awe of the flying thunder that survived beside them. This creature, the horse, possessed the power of spirit and speed that so inspired and tempted us that we soon bestride the beast. Thus empowered with these wings of passion, humans gained confidence and embraced challenges to explore new lands. The horse can still empower you to soar to greater personal and professional heights. "Very well conducted and received. The program permitted the team to discuss issues in a non-threatening environment, allowed me as the Chief to hear issues of concern to the team, and permitted me to reinforce the guidance, direction and policies of the organization." Does all this seem like a dream? 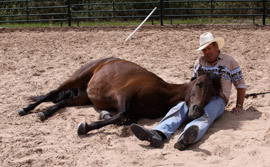 The fact is that it can all be yours if you learn the secrets and techniques that teaming with a horse can teach you! "This program combines the multifaceted nature of the horse and an extensive understanding of what modern corporations look for in training. It was not until I started reading about Innovative Horizons that I began to understand how little I got out of these other trainings.The results are not just tangible—they are immediate and gratifying. I believe the E.A.G.L.E.S. program will revolutionize adult training programs in a corporate setting and bring to the 21st century what Deming brought into the 20th century." We would like to answer any questions you may have about Innovative Horizons and schedule a seminar for you and your company.